This model has been discontinued Market is awaiting for its direct replacement. The replacement model is HXR-NX5R. Film-makers and Videographers are looking forward to the replacement of the Sony HXR-NX5 HD Camcorder. NX5 is an affordable HD Camcorder based on AVCHD technology with Three 1/3 � inch Exmore CMOS sensors capturing chip and SDI out exclusively for demanding professionals. It's been more than a year that Sony put an end to NX5, To get the nearest SDI output camcorder from Sony, users are forced to adapt the XDCAM series, PXW-X160 ( without GPS featrures ) or PXW-X180. However there are two concerns over this choice, the SXS card is costy, and the cameras are even higher by at least USD 600. The only advantage of the XDCAM camcorders are they are having zoom power more than 20x. with all the setback, it gives an advantage to to its rival Panasonic AG-AC160 to be on hype in the market. Currently, Sony does however have the nearest model to replace NX5 and with very close price range and that is HXR-NX3, unfortunately it does not have an integrated SDI Output but with only HDMI out. The two aforementioned Sony Camcorders share almost identical bodies; the in-built LED of NX3 being the immediate identifier between the two. Despite of the NX3 built in light, it is not dimmable and there is no supplied light filter which is necessary to make the object look softer and controllable. If the light cannot be controlled it will be a useless feature of the camera that Sony should look into and consider in manufacturing a new camcorder. A video camera that has direct menus to access the parameter at ease and enable to record SD catering for Asia market is most awaited. The replacement of HXR-NX5 should be equipped with a minimum of 20x Zoom or higher and a powerful Clear Image zoom like NX3 that can boost magnification right up to 40x is an effective camcorder to get all your important shots without losing the pixel count. And riding on the Sony unique Audio feature, with built in MI (Multi Interface) shoe element will be a definite added advantage over its competitors. Therefore, this suggested new features will make it the ultimate winner - a good choice for documentaries, corporate productions, wedding and events shooting. In short, if Sony going to replace NX5, the new camcorder "HXR-NX5R" should have better function, not only combining the best features of both NX3 and NX5, it got to be superb to be the winner in this category of cameras. And please forgive our blunt suggestion, that it , if the price point is good, Sony may as well discontinue the current NX3, allowing Sony to place 100% effort to promote the new camcorder. With this new "possible" Sony video camcorder, you can take all the credit for eye catching shots. Own one to get started and record the right look moves! 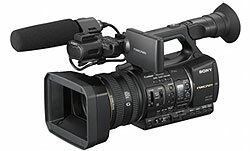 Introducing the Sony NXCAM product, Sony's first professional AVCHD camcorder with SDI output. It can record stunning quality 1920 x 1080 images at 24Mbps (50i or 25p), as well as supporting 720/50p and Standard Definition recording. Operational flexibility is further enhanced by support for dual media. The primary recording media is Memory Stick Pro consumer memory cards, which are affordable, readily available worldwide and subject to continuous development. There is also an all-new optional 128Gb Flash Memory Unit which offers 11 hours recording time at 24Mbps. 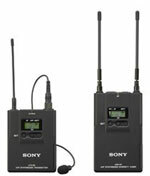 As with Sony's HYBRID HDV range, usage of the media is designed to be as flexible as possible - allowing simultaneous recording to dual media or a choice between media depending on the customer requirements. To fully realize the potential of the AVCHD codec in a compact camcorder, the prototype utilizes much of the same advanced technology used in the multiple-awarding winning HVR-Z5. Sony's newly designed G Lens provides excellent resolution, colour and contrast, in combination with 3 x 1/3-inch Exmor CMOS Sensor system using ClearVid array for excellent low-light sensitivity. This new compact camcorder is ideal when high performance is demanded using only available light. 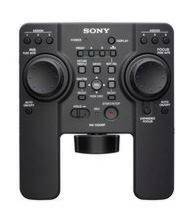 The ergonomically designed body allows flexible shooting under any conditions, while maintaining Sony's worldwide reputation for quality and high performance. Sony's exclusive high-performance "G Lens"
The NXCAM benefits from the exceptional optical performance of Sony's "G Lens". 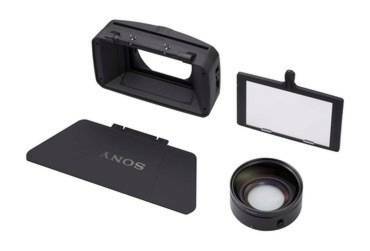 This sophisticated lens incorporates Sony's unique optical technology and unparalleled quality control. Moreover, it's been optimized to perfectly complement the advanced image sensor and image-processing technology, thus expanding your shooting possibilities. The 29.5mm wide-angle "G Lens" (equivalent to 35mm film) on the NXCAM offers a field of view that's ideal for shooting situations ranging from broad landscape shots to conditions where sufficient distance from the subject is difficult to obtain. A 20x optical zoom also enables shooting over a wide zoom range. for images that are crisp and clear even when shooting movies at high zoom ratios. Advanced optical lens technology makes the most of Sony's Exmor CMOS Sensor to realize sharper images with higher resolution and less noise even when shooting in very low light. The six-blade iris diaphragm is nearly circular, enabling the creation of extremely beautiful background blur. Newly designed focus, zoom and iris control functions provide convenient lens operation. The iris ring, located next to the zoom ring as with traditional professional lenses, allows users to adjust exposure with great precision. The zoom function is variable and can be controlled by using the lens barrel ring, the lever at the lens grip or lever on the camera handle. Additionally, once you select the high-speed zoom mode, you can zoom from wide to telephoto 1.5x faster than with the HVR-V1E. The NXCAM also provides 3 built-in ND (Neutral Density) filters and allows the use of an optional 0.8x wide conversion lens. in order to increase the signal density, while each pixel maintains sufficient surface area. In combination with Enhanced Imaging Processor (EIP), the Exmor CMOS Sensor system achieves high resolution, high sensitivity, wide dynamic range, and excellent colour reproduction. The pixel shift interpolation technique has been traditionally used in small 3CCD camcorders. However, it normally requires the combination of all three colour element (RGB) signals to maximise resolution. If an object lacks one or more colour elements, the resolution of the object may be degraded. The Exmor CMOS Sensor system with ClearVid array is different because it can always produce maximum resolution, regardless of the balance between colour elements, thanks to its unique and sophisticated interpolation technology. Exmor technology, which utilises the full potential of the CMOS Sensor system. Exmor features the column-parallel A/D conversion technique and the dual noise cancelling method also used in the Sony's top-of-the-line models. Multiple A/D (analogue to digital) converters on each pixel row convert analogue signals to digital as soon as they are generated, unlike traditional technology that only has one A/D converter on each chip. Exmor technology can eliminate the influence of external noise that enters the signal chain during transfer to the A/D converter, resulting in high-quality digital signals with extremely low noise. This significantly enhances shooting in low-light environments. * At 1/25 shutter, auto iris and auto gain. The NXCAM will be able to utilise the innovative AVCHD format to record at a variety of bit rates and interlace or progressive depending on requirement. Recording up to 24Mbps 1920 x 1080 50i or 25p. 720/50P recording is also possible. SD recording is also possible using the MPEG-2 codec at 9Mbps, similar to DVD quality. Audio is recorded in AVCHD modes in full 2-channel linear PCM audio. needs to move with a subject or is carrying out handheld shooting for a long period of time. The NXCAM features a GPS function which embeds GPS metadata when recording. Time and location is recorded and can be displayed on playback. This function is useful for locating footage for specific geographical locations from the archive, else for displaying the location graphically on a third-party mapping software. HD-SDI output is available for use with other HD-SDI infrastructure such as picture monitoring. Uncompressed digital HD video and audio signals are output from the HDMI connector. You can see stunning HD images on an HDMI-compatible monitor display. During shooting, a pre-compressed 1920x1080i/4:2:2 signal is output from the HDMI connector. A 3.2-inch type XtraFine LCD is located on the NXCAM in the same position as on the HVR-Z5E. With approximately 921,000 pixels, this is 4x greater than the LCD of the HVR-Z1. The XtraFine LCD displays virtually 100% of the recorded picture area at 6500K colour temperature. colour reproduction accuracy and high resolution*. The EVF has a selectable display mode between Colour or Black and White. The Xtra Fine EVF displays virtually 100% of the picture area at 6500K colour temperature. seen on the object in the EVF momentarily. The NXCAM uses the same NP-F970/B batteries as the HVR-Z5, HVR-Z1, HVR-V1, and DSR-PD170P, so you can use your existing chargers and batteries. A one-touch clip-type microphone holder makes it easy to attach and remove the microphone for quick setup/storage. Set yourself apart from the competition with superb quality images and superior low-light capabilities providing the ability to work in the most demanding natural light conditions. The key to this exceptional performance is one of the best camcorder front ends on the market. Sony's "G Lens" incorporates unique optical technology and unparalleled quality control. Moreover, it's been optimized to perfectly complement the advanced image sensor and image-processing technology of the newly developed Exmor CMOS processors with ClearVid array. Outstanding images demand similarly high quality audio and Sony is the first manufacturer to provide Linear PCM audio for a compact AVCHD camcorder. You can be confident of getting the best possible audio whatever the circumstances. also use both media simultaneously. Many customers require simultaneous recording for a variety of different client needs, including ease of editing and archiving. The recording of SD and HD at the same time is also possible. Flexibility is key to the NXCAM concept. is also possible. Audio is recorded in AVCHD modes in full 2-channel linear PCM audio.